CORONA, Calif. -- A husband and wife in Corona were arrested after driving a Dodge pickup with their son in the truck bed full of water absorbent beads. The stunt was posted to YouTube. Corona police said investigators learned of the incident through social media. The couple behind the stunt, 45-year-old Holly Piazza and 37-year-old Brian Chase, were arrested for misdemeanor child endangerment. The two posted the video, titled "Driving a truck full of Orbeez," to their YouTube channel, RoccoPiazzaVlogs. 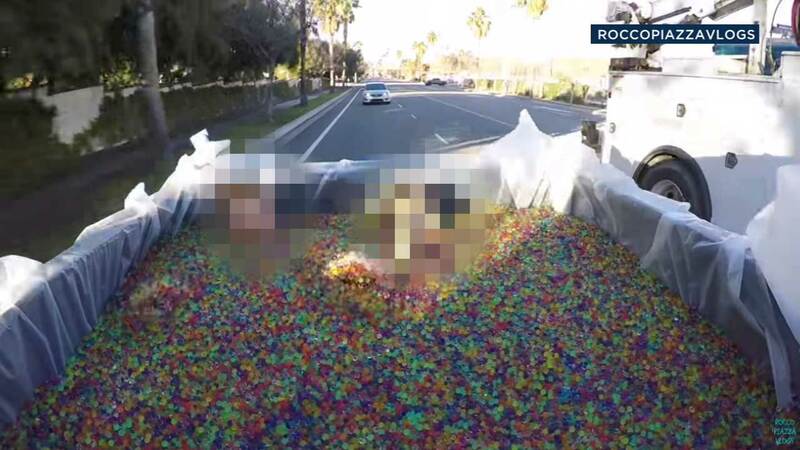 The video shows the couple's 8-year-old son and an adult sloshing around in a truck bed full of Orbeez as they drive around Corona. Orbeez are gel type beads that absorb water and swell up to 300 times their size. The prank landed the two in jail, and Piazza was also issued a ticket for dumping the slippery beads onto the street. Police say they'll also be charged for the cleanup. If you have any further information about this case, you're urged to contact Officer Clark Eveland at (951) 817- 5764.